ANNUAL COL. SAM CLEAN-UP DAY: Organized by Alan Roy. Sunday, April 14, 9AM. FOSS WINTER BIRD FEEDER PROJECT: A great success! Thanks to all our dedicated volunteers. POLLINATOR MEADOW: FOSS is working with the City of Toronto to design and plant a pollinator meadow in the park. Students from Sir Sandford Fleming College (supervised by Janette Harvey, City of Toronto) will design the garden and make suggestions as to the nature of the plantings. The project will begin in 2019. Final completion date is yet to be determined. NAMING PARK ENVIRONMENTALLY SENSITIVE AND NATURAL HERITAGE AREAS: A FOSS mapping project to assign names to significant areas of the park (such as the already-designated “Whimbrel Point”) in order to provide consistency when communicating info about Col. Sam. For more details, check the blog. PARKING LOT TICKETING BLITZ: The city has recently been conducting parking ticket blitzes at Col. Sam. There is a two hour parking limit for the south lot. Please report any parking problems to 311. FOSS SOCIAL MEDIA ACCOUNTS: Check out FOSS on both Instagram and Facebook. No personal Facebook account? You may still view the contents, but you will be unable to post comments. 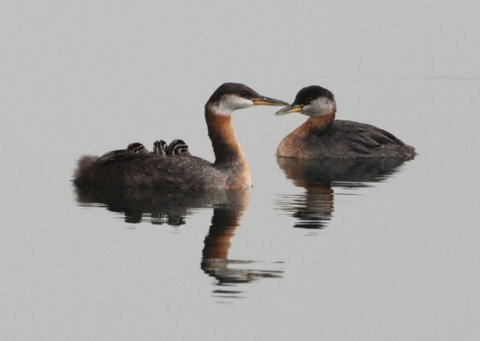 Keep watch for nature photos highlighting your park. DRUG/GARBAGE PROBLEMS AT COL. SAM: Discarded drug paraphernalia and litter are on-going detriments in the park, particularly in the North Creek area. Visitors are asked to notify the police at 416 808-2200 for drug infractions and 311 for trash build-up. Any problems reported to 311 are greatly strengthened when accompanied with a photo. 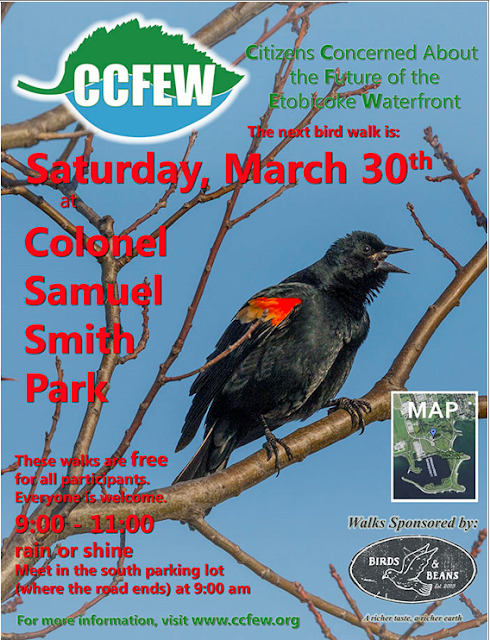 SAM SMITH PARK BIRD WALK, SATURDAY, MARCH 30TH, 9 A.M.
Once again this year "Tree For Me" is offering a free tree or shrub for local residents. Please see their website for details. Trees may be picked up at several locations. 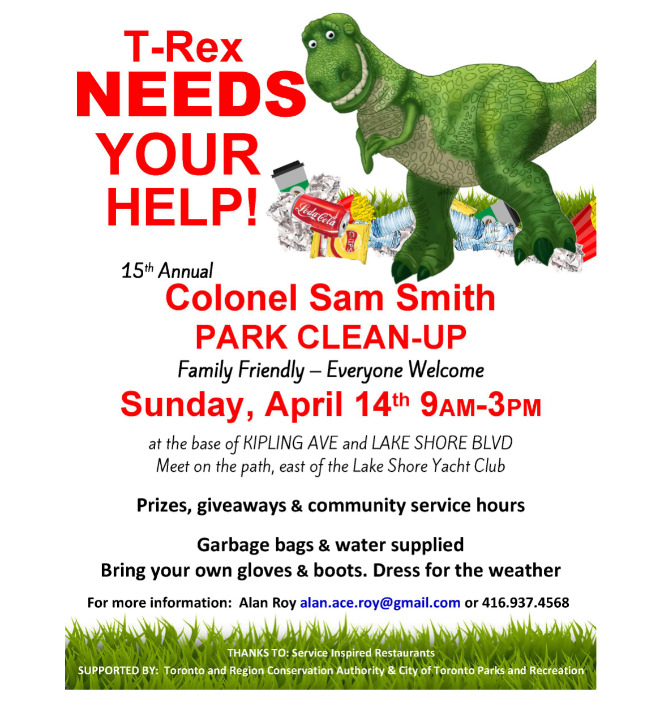 One location will be the Assembly Hall, at Colonel Samuel Smith Park, on Saturday, May 11, when LEGS has their annual Plant Exchange. LAMP will be organizing the tree distribution at this event. 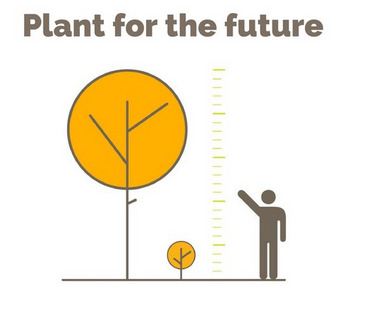 Take advantage of this great opportunity, and plant a tree or shrub to support, birds, pollinators, and people!